If there are true crime books that can be read in three sittings or less, Ann Rule’s books can be counted among them. Though some may not have warmed to her latest book, Don’t Look Behind You: Ann Rule’s Crime Files #15 (Pocket Books Mass Market Paperback, 2011), I must say I wasn’t disappointed in the least. While there were some editing errors, the character development and storytelling were done very well. As a true crime fan who is fascinated by old cases, Ann Rule makes each story jump off the pages and bring them back to life. She’s sympathetic toward the victims, gives vivid inside looks at crime perpetrators and detailed investigation information. It’s almost as if the reader was there from time the crime is first discovered until the defendants learns their fates at trial. 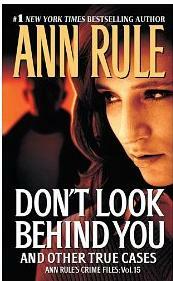 Don’t Look Behind You is well-researched – as other Ann Rule books – with most cases she’s written about being cold (some over decades old). The three stories outlined in this book are no different. Each Case Files books revisit such cold cases, complete with photos, trial transcripts, and meeting the people behind each investigation. Of all stories in Don’t Look Behind You, I recommend both the first and second stories the most (the second is the JoAnn Hanson case, whose body was never found. If you aren’t already familiar with the Hanson case, Google it.). In addition to its attention to descriptive detail, Don’t Look Behind You is written with compassion and warmth. This is another book I recommend for the true crime fan on your holiday shopping list.